ScopioneUSA.com - Blog - Will the GM Duramax Rival Ford and Dodge’s HD Trucks? Although they sit atop the HD truck market, the Dodge Ram and the Ford Super Duty have received a challenge from the new GM Duramax HD. Scheduled to be released in 2016/2017, GM’s Duramax HD engine is expected to undergo some significant changes which will provide more horsepower and torque. The improvements are designed to bring the Duramax into line with its rivals. While the details are still somewhat sketchy, the upgrade will be similar to the engine modifications that the Chevy Silverado and GMC Sierra 2500/3500 models offered – a 6.6L Duramax block. However, the new GM version will have a more sophisticated electronic controls and injector system. In addition, the initial reports on the engine indicate that it will offer 440 hp along with 850 lbs – feet of torque. No official announcements have been made concerning Duramax modifications. 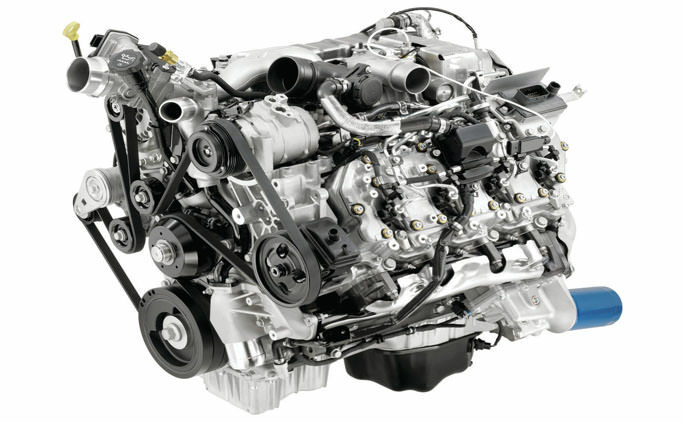 Since the Dodge Ram recently pushed the output of their 6.7L Cummings six-cylinder engine, it’s assumed that GM will improve the power train for the Duramax. Plus, with the current Super Duty Power Stroke delivering the best horsepower, GM will surely deliver improvements on their next production line. It’s the only way GM will keep up with competition! Only the best and the strongest pickup trucks compete in the Heavy-Duty Challenge. For the 2014/2015 model years, the competition will include diesel one-ton and gas-powered ¾ ton pickups from the three main automakers. The GM HD Duramax is expected to be a formidable competitor and challenge Ford and Dodge models. The GM Duramax has many spectating car enthusiasts waiting in excitement. Will GM’s design and powerful engine beat competition? If anything, such advances are short-lived since automakers often build upon their shortcoming and innovate for the following year. This is definitely a step forward for GM that will inspire more people to purchase their new vehicle. Click here to check out our catalog and upgrade your ride! ScopioneUSA offers aftermarket auto parts and car accessories for your vehicle made from carbon fiber. Carbon fibre has become quite popular in recent years, due to its durability and lightweight qualities. Today, ScopioneUSA offers a number of carbon fiber automotive parts that include bumpers, spoilers, and grilles – along with select pieces for the lip, hood, and trunk. In addition to automotive parts, ScopioneUSA also offers motorcycle carbon fiber parts that exude strength and durability and weigh considerably less than comparable steel items. Our online catalog offers carbon fiber protection in the form of panels and side covers, that’ll lighten your load. You’ll be zooming down the highway in no time!